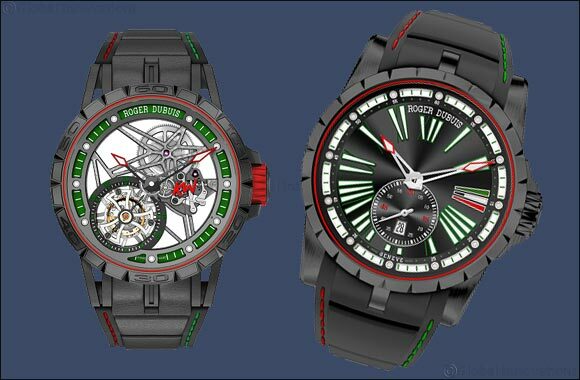 Dubai, UAE, February 21, 2018: Roger Dubuis, has announced the launch of two limited edition masterpieces to commemorate the National Day of Kuwait on February 25. These exclusive commemorative watches – an Excalibur 45 and an Excalibur Spider 45 - are specifically designed to incorporate in its signature facets, the national colours of the Kuwaiti flag, in recognition of the achievements of the Kuwaiti leadership and citizens and to express the maison's appreciation of being enthusiastically received by fine watch aficionados in Kuwait. Limited to only eight pieces, the Excalibur Spider 45 mm, sports an elegant black DLC skeletonized titanium case and proudly sports the Kuwaiti flag colours with a red container, green flange, red gasket, red spider hands, red crown and red initials KW displayed on pull out spring. The watch, which is powered by the manual winding RD505SQ movement, comes with a bi-material strap with black rubber base and black calf inlay, red and green stitching along with a black DLC titanium adjustable folding buckle. Produced in a limited edition of 28 pieces the Kuwait National Day Excalibur 45 mm also sports a black DLC titanium case, and its elegant display shows off green-framed white SLN indexes. The red gasket, red spider hands and the third index with black, green, white and red colours complete the Kuwaiti look. This special RD830 automatic movement comes with a black rubber strap with red and green stitching and a black DLC titanium adjustable folding buckle.